Newly revealed documents from the Milwaukee-based Lynde and Harry Bradley Foundation show that the foundation gave significant grants to a diverse array of media institutions, including media sites that pursued a highly partisan agenda. 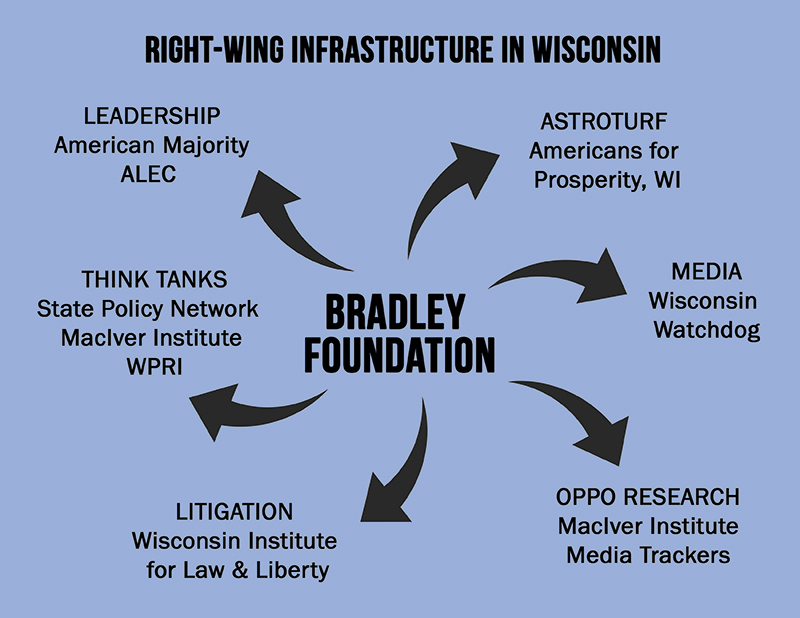 The Bradley Foundation provided crucial funding to “Wisconsin Watchdog” as the Franklin Center for Government and Public Integrity, a right-wing media organization focused on building news bureaus in state capitals across the nation, slowly sank. The Franklin Center was founded in 2009 with help from the Sam Adams Alliance, a now-defunct new media group founded in 2006 by Wisconsinite Eric O’Keefe. O’Keefe had long-standing ties to billionaire dark money activist David Koch and late Terry Kohler, a secret donor to O’Keefe’s various dark money groups. Franklin center staff were hired from both the Sam Adams Alliance and the Kochs’ Americans for Prosperity group. Franklin Center flourished with a huge influx of funds from Donors Trust and Donors Capital, the preferred funding vehicles of the Koch Network of donors that masks the true identity of givers. The Franklin Center reported annual revenue between $7 and $12 million between 2011 and 2015. In 2011, CMD reported that the Franklin Center claimed to have 43 state news websites with reporters in 40 state capitols. Some outlets, like Wisconsin Watchdog, had received official reporting credentials. In some states, the reporters and news sites were attached to State Policy Network “think tanks,” important institutions in the “infrastructure” Bradley was building nationwide. Newly obtained documents from the Bradley Foundation show that in recent years the Franklin Center has foundered. The number of state offices dwindled to five in 2016 and employees fled the sinking ship when a single, mystery funder withdrew support. It is a “text book case of imprudent funding,” wrote Bradley staff. “Unable to resist the offer of $10M annually from one source, the organization grew beyond its capacity to manage itself, and became too dependent on one funder, making it able to shrug off criticism from elsewhere (including Bradley). Last year, when that funder shifted priorities and the fecklessness of the administration became evident, the organization began to collapse” (Grant Proposal Record, August 16, 2016). The Bradley documents do not say who the mystery funder was, but they do indicate that the group was also funded by the right-wing Searle Foundation with smaller “matching grants” of $35,000. The decline of the Franklin Center is a blow to efforts by right-wing funders to develop state capitol media sites to compliment right-wing news sites covering politics in Washington, D.C., such as Breitbart News. 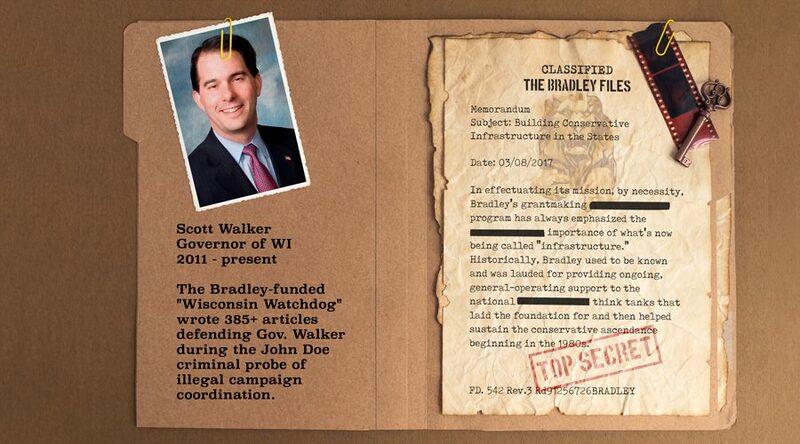 At the time, the Bradley Foundation was run by Michael Grebe, the former general counsel to the Republican National Committee and the chair of Scott Walker’s campaign for governor 2010, 2012, and 2014 and for president in 2015. According to the Watchdog website, Kittle wrote over 385 articles on Wisconsin’s “John Doe” investigation into coordination between dark money groups like Eric O’Keefe’s Wisconsin Club for Growth and the Walker campaign during 2011-2012 Wisconsin recall races. Kittle portrayed a investigation, launched by a bipartisan group of district attorney’s and run by a Republican Special Prosecutor, as an untethered partisan witch hunt. “Wisconsin Watchdog became the state’s leading reporter of the John Doe investigation, bringing to light a story of political persecution that is still ongoing,” say the Bradley documents. Bradley especially appreciated the fact that Watchdog had “close ties” to “insiders in the Doe” (Grant Proposal Record, November 10, 2015, August 19, 2014). By financially supporting Wisconsin Watchdog, Scott Walker’s campaign chairman effectively secured a one-sided, 24-7 propaganda arm for the Walker campaign and the dark money groups under investigation. This agitprop was so successful, Kittle’s articles were cited as fact by the right-wing majority of the Wisconsin Supreme Court when they shut down the investigation in July of 2015 after failing to develop any fact record in the case. This the type of “communications” infrastructure Bradley is interested in exporting to other states as CMD detailed in its report “Weaponized Philanthropy” on the Bradley Foundation’s infrastructure investments. Matt Kittle has landed at the Bradley-funded MacIver Institute, another State Policy Network “think tank” and he is already hard at work writing more articles about the John Doe. In Bradley world, titles might be interchangeable, but the hard work of spinning disinformation on behalf of Republican politicians and policies must go on. Click here for our full series on the Bradley Files. Evan James, Nick Surgey, and Lisa Graves contributed research to this series. It’s absolutely terrifying that the Billionaires pay for these lies. They have no pride in America only what they can make it into with the Koch Brothers and all the others. They want to set up a country where only the elite have health care, wealth, position, just like the DeVoz-Prince clan who want to make everyone think like they do. We already have the Dictator in Chief in the White House and all the billionaires in the Cabinet. And it seems that the Republican Congress is terrified to do anything they aren’t told to do. But the very tactics they are using will also destroy them because they have under estimated the people of this nation and their ability to fight these people. I hope I live long enough that all of them end up on the dustbin of life, banished from every facet of life that they enjoy now. CMD and writers, thank you so much that you are exposing these criminals who want to make all who are not wealthy serfs and their employees without any rights. CMD should be designated democracy’s national treasure. CMD’s staff deserves the U.S. Medal of Freedom. When Bill and Melinda Gates, the oligarchs who are privatizing America’s most important common good, public education, are stripped of their Medals, it will be a great day in human history..